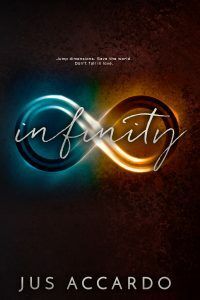 Jus Accardo » Win a signed copy of Infinity! Win a signed copy of Infinity! We’re almost at the one week point for Infinity’s release. I cannot wait to share these characters with all of you! Can’t wait to read this book:). How did you get the idea to write a dystopian novel? A Fringe inspired ya novel? Enough said. Looking forward to even more now. I love her other series! Can’t wait to read this one! I received an ARC through NetGalley and loved loved loved it. I am going to buy it for sure if I don’t win a physical copy. My question is, when does the next one come out?!?! Hey Sabrina! 🙂 I’m so glad you liked it. You just totally made my night <3 As for book two, I believe it will be the end of next year. I haven't heard yet exactly where its going to land on the schedule, but will keep everyone posted. This will be a long year wait!!! But congrats this is a great book and I will be spreading the love about it! This book sounds great. 🙂 I don’t really have any questions for you, you know, since clowns are off the table. 😉 Thanks for the chance! Caught the teaser on facebook and this one looks really good!